A lot of cats like to collect things. Hairbands, dustballs, and even small, dead animals are all common stashes to be found in a kitty’s horde. But Brigit, a Tonkinese cat from New Zealand, has been hording things of a more private nature. She’s been pilfering men’s underwear from her neighbors, which she lovingly presents to her owner, Sarah Nathan. 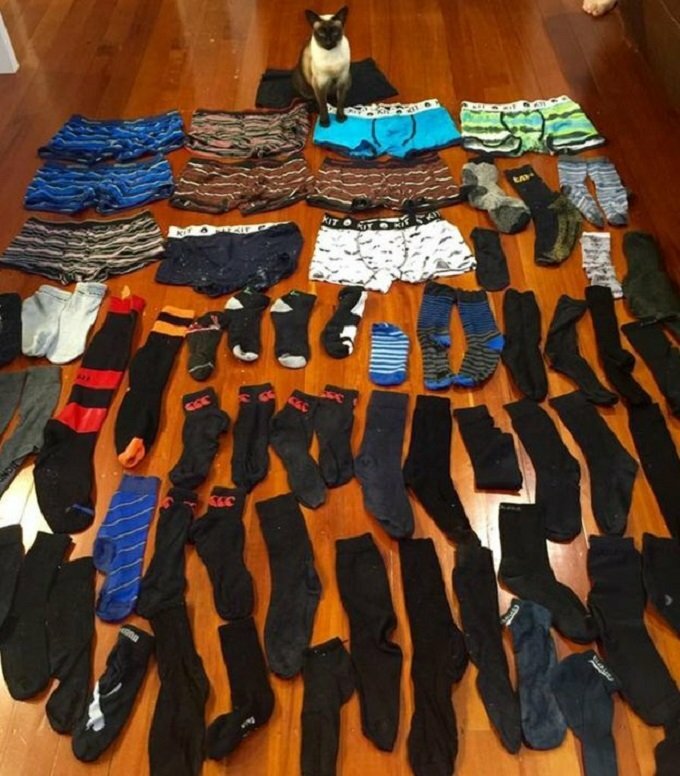 All in all, the cat burglar has taken about 30 pairs of men’s boxer briefs and over 100 socks. It started when Nathan noticed the men’s undergarments in her laundry. Living in an all-female home, she thought this was odd. But the source of the laundry wasn’t revealed until Brigit was caught red-pawed bringing a sock into the house in her mouth. The cat’s obsession continued even after Nathan posted a picture on Facebook, saying that someone had to be missing these items and should claim them. She even went as far as putting flyers up around the neighborhood to try to return the clothes. This is not the first time Brigit has shown her penchant for taking what doesn’t belong to her. At their previous home, the cat would take children’s toys and clothes from neighbors, as well. Nathan plans to move soon, and she hopes that this will remove Brigit’s opportunity to steal men’s briefs. But who knows what she’ll have her kitty claws on at her next home. Does your kitty ever come home with stolen presents? Have you had to return anything your cat has taken? Let us know in the comments below!